The vivo iQOO was initially offered in four configurations - 6GB/128GB, 8GB/128GB, 8GB/256GB, and 12GB/256GB. Today, the company has announced a fifth variant of this smartphone which comes with 12GB RAM and 128GB storage. This new variant is priced at CNY3,698 ($551/€487) and will go on sale in China from April 14. And, unlike other versions, this one will only come in one color - Electric Blue. 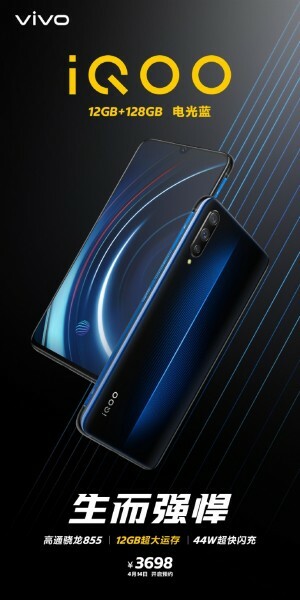 The vivo iQOO is a gaming smartphone and has Snapdragon 855 SoC under the hood. It's built around a 6.41-inch AMOLED display and features a triple camera setup at the back consisting of 12MP main, 13MP ultra-wide, and 2MP depth sensor units. The smartphone packs a 4,000 mAh battery with 44W fast charging support.